I was up all night with a stomach ache that started around 11pm. Not sure what it is, but I was spinning and nauseous. I ended up throwing up at 4am and was weak and ate half of what I should have today. It’s still holding on now and I was only able to get half my dinner down, but I’m hoping it will pass by the morning. I’m thinking it’s just me adjusting to the heat and the alkaline in most the water out here. Katherine had some unpleasant digestive stuff for 24hrs yesterday, so it’s good to know it isn’t just me. Other than my lack of energy today, it was actually a really nice day. 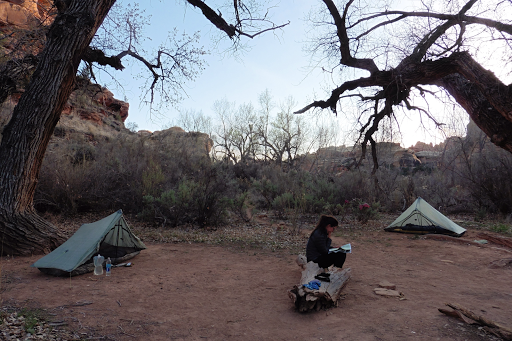 We are now on the Salt Creek Alternate for a few days, which most Haydukers tend to do. 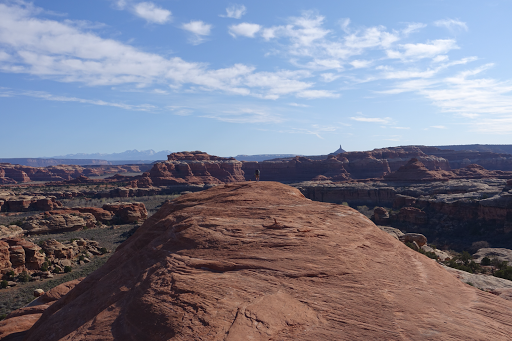 The day started with a great 5.4mi on the Peekaboo Trail. We got going at 7:20am after a slow start for me and us taking advantage of the running water to do some laundry. 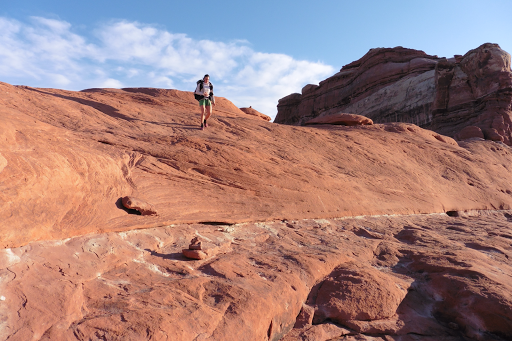 Peekaboo started off with some dirt trail and soon got up on slick rock the rest of the stretch marked by cairns. It was great and I highly recommend it if you are ok with exposure. We knew we only needed to do 16mi today due to camping restrictions, so at least there wasn’t any pressure and we took it at a relaxed pace. 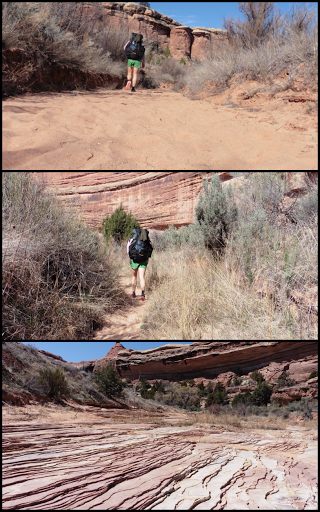 After Peekaboo, we entered Salt Creek Canyon and will be in here for two days. 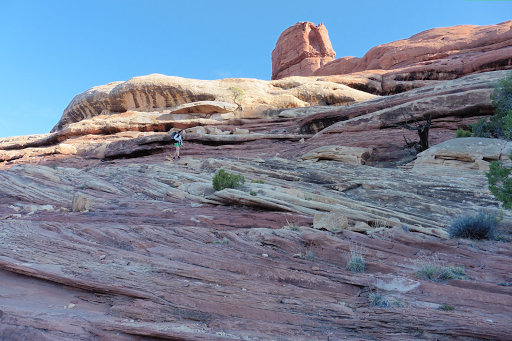 There was a lot of variety in the terrain with deep sand, overgrown trail, rocks, and dirt trail. It really isn’t all that hot (upper 70s), but the sun is quite hot when it’s directly on you and I had a rough time with such little energy. I just couldn’t eat or drink much and that was not good. The MP3 player came in handy as a distraction. 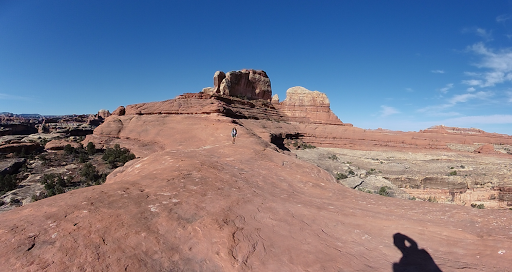 At the end of the day, we took a side trail for 1.6mi each way to see the recommended Angel Arch. It was really nice and we hung out there for a bit. I wish I had been feeling better and could have enjoyed it more. 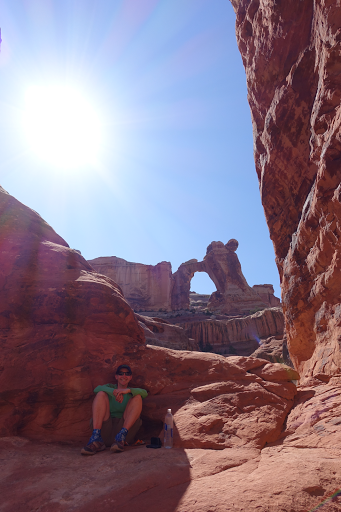 Here I am hiding in the shade with Angel Arch as I was really tired at this point of the day. We got to camp before 5pm and I’m really liking these early camps. We may not do it all trip, but it’s been nice to do them in the beginning. We are camped by water and the campsite isn’t in sand for the first time this trip! Especially with the rough start I’ve had this week, which I anticipated. The good news at least is that the heat rash is improving already! At least something is starting to adjust!